One of the earliest articles I wrote here at Celestial Lands is one where I seek to define, for myself, the meaning of faith (that faith is not belief, it is “sacred trust”). I sometimes think we Unitarian Universalists and others of Liberal Religion have a harder time coping with the word faith than we have with words like “God” or “Salvation” or the dreaded “E” word… Evangelism. I’ve been thinking a lot recently about why those of liberal religion struggle to articulate and live a concept of faith, even though I believe our tradition is profoundly faith-filled. I know, that’s weird to hear… but the theology, philosophy, cosmology, values, and principles of Liberal Religion are just about the most faith-filled understanding of what is that I have ever encountered. Our stated values and beliefs are, in my opinion, one of the most faith-filled professions that anyone has ever made. That all people have inherent worth and dignity is not just a principle… it is an article of faith. That the arc of the universe bends towards justice is not just an assumption… it is an article of faith. That human capacity can have a positive effect on the cultures, lives, and world we share is not a provable concept… it is an article of faith. That Love, Compassion, and Generosity build a better human community more in tune with our spirits and souls is not something we can empirically show… it is an article of faith. That all people have the capacity for good within them is an article of faith. That revelation is continuous, and that we seek that revelation through meaning making in our lives in an article of faith. That we can disagree, even on articles of faith, and still be in religious community with one another is an article of faith, and one our own communities of faith regularly fail to live up to (or love up to if you like). Peace… the possibility of peace, whether it be in the world, in a nation, in a community, in a church, in a family, or in an individual human heart… the possibility of peace is an article of faith that has never been proven to exist in the world… at least not for long. That is the faith I believe in. That is why I am a Unitarian Universalist Minister, and not a Deist activist and organizer or studying to become a Zen Priest or an American Baptist or a member of the United Church of Christ. I am a Unitarian Universalist because of that faith-filled hopefulness and sacred trust that shouts that our faith is a “Faith in People, a Hope for Tomorrow’s Child, and a confidence in a continuity that spans all time”. 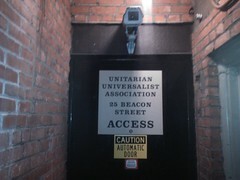 I went looking for the most faith-filled religion I could find, and I found Unitarian Universalism. We do not hold faith in a book, or a prophet, or even a single idea. Our faith is in the entirety of all things… including ourselves. And yet, we rarely seem to own that our shared beliefs, values, and theology rests in such a profound faith. And because we rarely seem to internalize what a profound faith we hold, we sometimes, and quite often, act as if we have little to no faith at all. I see a lack of faith in how both our congregations and our denomination seems to be much more comfortable studying the issues that confront us that moving into faith filled action to address those issues. I see a lack of faith in how many of our congregations have moved away from “calling” ministers and towards contracted ministries … be they consulting ministries or “contract to call” ministries. I see a lack of faith in our resistance to sharing our religion within the world. I see a lack of faith in our believing that it is our tradition, our past that justifies us, our existence on the religious playing field of our culture. I see a lack of faith in the secrecy around our ministerial search process. I know it is controversial to say this, but what may once have been intended to be confidentiality to protect the equality of the process has become a secrecy that is creating shame and doubt among both ministers and congregations. I believe that part of the reason that confidentiality devolved into secrecy is that we do not “have faith” that we are all operating in the process for the overall benefit of a shared faith. I see a lack of faith in how we do stewardship, in how we connect with our youth, in how many congregations (and sometimes the denomination) treat staff, in how we challenge each other. There are almost as many ways I can see a lack of faith as I can find articles of faith in our liberal religious tradition. This disconnect, this paradox between such profound professions of faith as exist in our principles, our shared values and beliefs, the common theologies and philosophies that rest among us… the disconnect between that and how we are often challenged to live faith in our lives and in the practical life of our congregations and our religious movement is I believe the central task before us in becoming what we have the potential to become. We will never make them the same… no one will ever live their faith in the full… but closing this gap is I believe the next step in the maturation of Unitarian Universalism and of Liberal Faith. I understand and agree with you about your reasons for being UU, but I get nervous when we start to compare UUism to Christianity. This blog post could have been written by liberal Christians of many stripes. While thier faith may be rooted in a book, prophet or single idea, it is not confined to that book, prophet or single idea. Thank you for your comment. It is not surprising that the article could have been written by a liberal Christian… because it was. I am a UU Christian with a Zen practice and a Deistic understanding of God… So my intent was not to “compare” but to speak from my blended theology… as I always do. And thank you for the nit… it has been successfully picked!